Come on! This duochrome is ridiculous! Brace Yourself is a dark green to purple duochrome with really fine silver flakes. I went through all of my polishes that are green/purple duochromes and I couldn't find one like it. I mean, I have other ones that flash green to purple, but they aren't nearly as prominent or interesting. The formula was fantastic, but it was pretty sheer and needed 3 heavy coats to cover the nail line. Ah yes, another unique polish! Guilty Pleasures shifts between green and copper and has a ton of multichrome flakies. Some of the flakes were pretty big, but you could always easily remove those if they bother you. This is a Colors4Nails exlcusive, so if you are interested in getting it, it's only available on their website. Again, 3 heavy coats were needed, but you could always use a base coat if you wanted. Like Brace Yourself, Jumping for Joy is also a green to purple duochrome, but this one is heavy on the multichrome flakes. The green is a bit brighter in this one, and it looks like there could be some gold color in there. This applied the same as the colors above. I used 3 heavy coats for full coverage, and it applied like a dream. Don't make me pick a favorite of the 3 polishes, just don't. Unfortunately, this one is currently out-of-stock on the Color4Nails website. 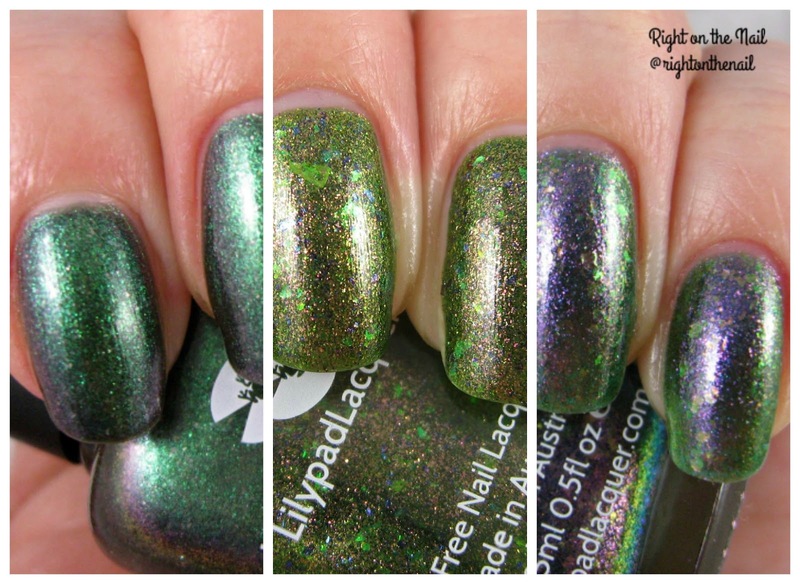 but you can still order it straight from Lilypad Lacquer. The prices vary depending on where you buy them. They are generally $13 for normal stock and $14 for exclusives at Color4Nails. Cosmetic Sanctuary has a 10% coupon code for any purchase from Color4Nails, so make sure to use that if you order (code CSant10). If you don't live in the US, check their website for stockists in other countries. You can also find out more information about Lilypad Lacquer on their Facebook and Instagram pages.